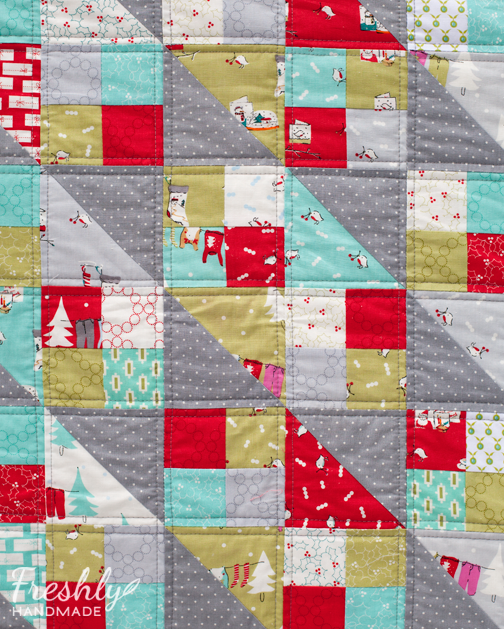 The hope of having my Cherry Christmas quilt done earlier last week came and went like a blink of an eye. I had to set it aside for a few days to get some other holiday projects complete, so it took me longer than I expected. However, the entire family is now thoroughly enjoying the comfort of this quilt. 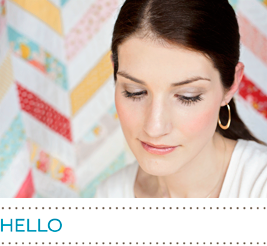 You can read my earlier posts about this quilt here and here. It finishes at 58"x72" and is made up of 4" half square triangles and 4"quadrant type squares. For the backing, I used a super soft solid, charcoal-colored minky and quilted 1/4" from each horizontal and vertical seam with gray thread. I did add cotton batting, so between that and the heavier minky backing fabric, it's a wonderful weight for these cold Wisconsin winter days. I also entirely machine-stitched the binding, which isn't something I typically do. Normally, I machine-stitch the binding to the top and hand stitch it to the back, but I don't think that would have been a good idea with the minky. My friend Ann showed me how she stitches her binding to the back first and then finishes it by machine-stitching it down on the front. I've tried other methods in the past with mediocre results, but her way seemed to be a great method for this type of quilt. 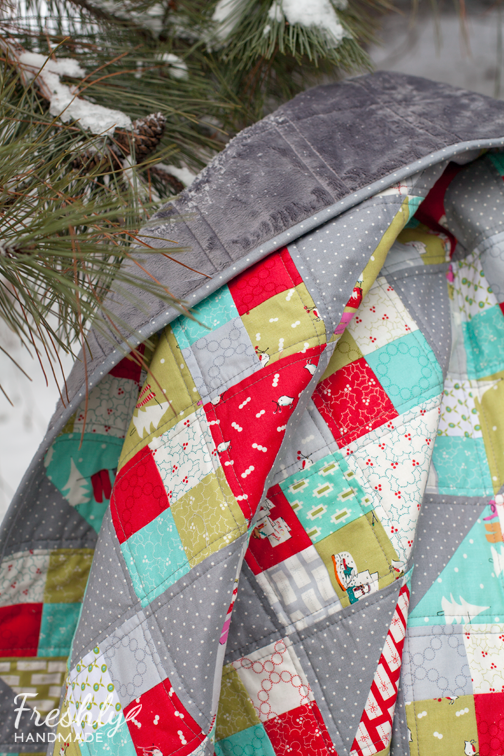 And because I finished the quilt before Christmas this year (yay! ), I decided to use it in our family Christmas photos. Here are a couple from the shoot. I seem to have been in great denial about when Christmas was this year, because I am SO not ready. Besides, my dad's quilt, I don't have any other presents made or purchased and we are visiting with one side of the family already this weekend...panicing! I promised my kids we'd still make cookies too. I vowed to keep this year simple and low key, so I just have to keep that in mind. I'm just glad I got my Cherry Christmas quilt finished. Your quilt is so beautiful. 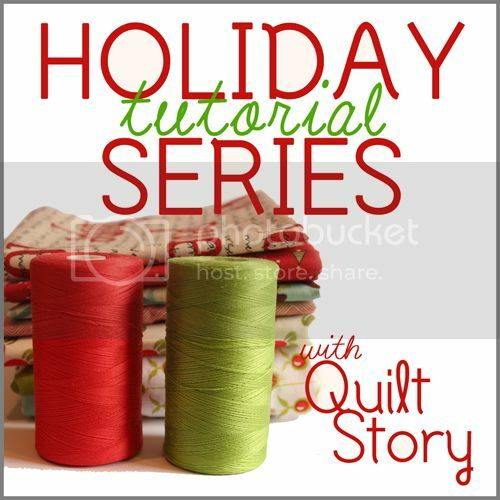 I've been wanting to make a quilt with minky backing but am so nervous. Gorgeous! And the family photos with the quilt are genius!! Such a pretty quilt! And it looks so great in your family Christmas photos! What a great idea. 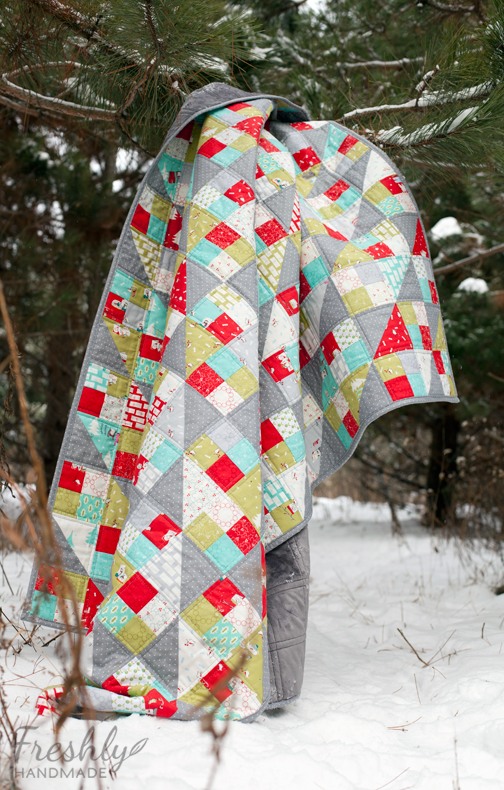 This quilt looks amazing and so warm! Nice finish! wow!! 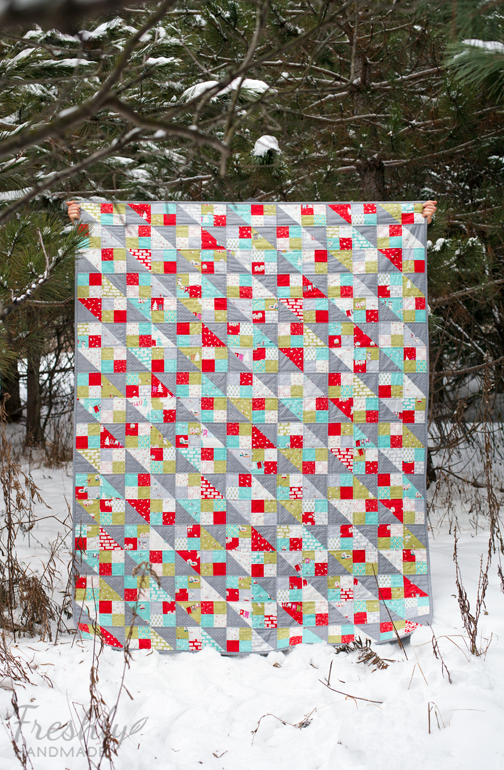 I love it, love the pattern, and LOVE the reds, and aquas and the greens together!! This is SO cute!!! 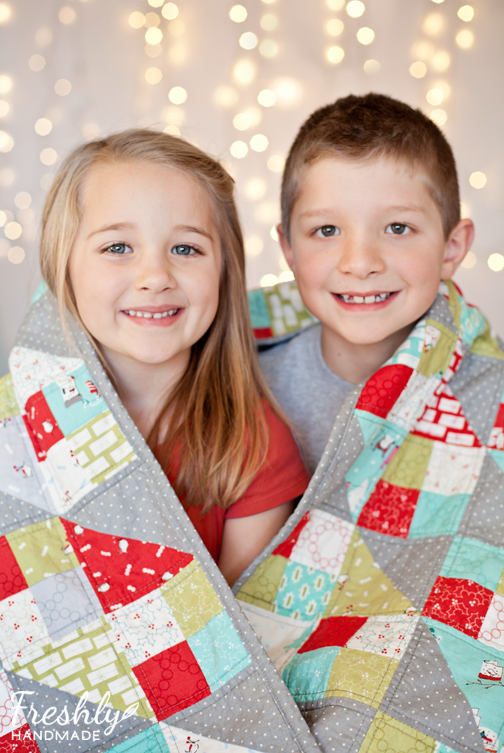 And the quilt was a great idea for your family photos, which are so adorable BTW! Lovely! The quilt is just beautiful! And the family photos are gorgeous! You will get the other stuff done - just don't let it worry you and it will be fun. Merry Christmas! 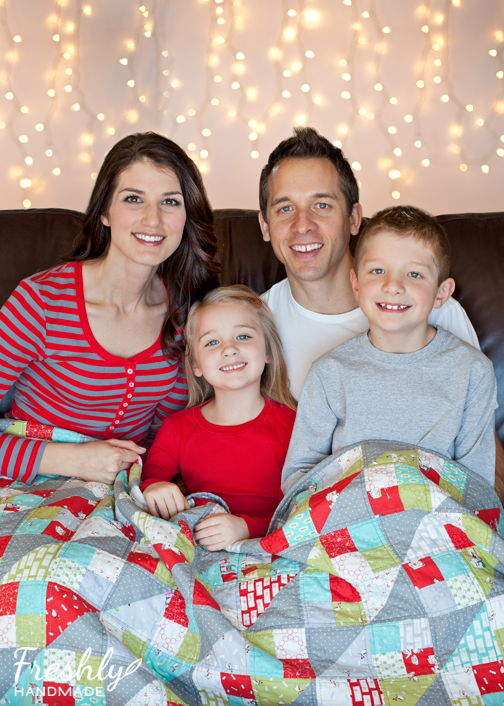 Oh wow, what a beautiful quilt and an even more beautiful family! Merry Christmas to you all :) The next quilt I make for us to keep will have minky on it, because my husband has finally admitted that he prefers the "normal" throw blankets because they're fluffy. Fine then! Looks fantastic! I am so pleased to see it finished, I love the fabrics and colours. Well done! !